Ships from and sold by riviera_america. Get cracking the eggs as Jill Colonna shows you the easiest way to make the Parisians' favourite afternoon treats: eclairs, tartlets, millefeuilles, and macarons, and guides you to many of Paris's best patisseries and tea salons.Share in Jill's enthusiasm and skills learned from the French over her 22 years in Paris to help you master patisserie easily at home. With 50 typical teatime recipes, enjoy tips, stories and a walks section that shows where to taste many of the best pastries in Paris.Lavishly photographed, Jill starts with simple and mouthwatering French teacakes, hot chocolate, crepes and ice cream then continues with clear step-by-step instructions for each chapter: choux (eclair) pastry; tartlets; millefeuilles; and gluten-free macarons. The final chapter culminates in a French tea party, mixing and matching the recipes to produce temptations such as Chocolate-Earl Grey Tartlets with Orange-Liqueur Crumble Puffs, a Paris-Brest with a twist and a Saint-Honore, plus many more treats that you'll be inspired to create yourself.This book will help the learner baker build confidence. Complete with tea-pairing suggestions, add your own Parisian touch to 4 o'clock teatime in no time. Jill thought patisserie and macarons were hard to make when she first moved to France, after she fell in love with a Frenchman in her native Scotland. Making the move to Paris in 1993, Jill couldn't speak much French and had never needed to entertain before. Realising her banana surprise with custard from a packet mix was not going to hack it with her French dinner guests, she needed to improve her culinary skills tout de suite in order to impress. Over the years she has gained confidence by learning cookery tricks from her French friends and family. As a busy working mum, Jill began to make patisserie as a hobby - partly as a challenge, and partly for her budget. Calling herself a "lazy gourmet", she loves exploring ways to make impressive-looking treats without spending too much time or money on them, while keeping the authenticity of pastry's exquisite taste. Previously a professional musician, Jill continues to enjoy playing flute and piano and also conducts chocolate shop and patisserie walking tours around St Germain des Pres in Paris. Jill is delightful and the concept behind this book is great. If you have any issues with recipes or questions for her, she is easy to reach via her social media pages, so delicious French pastries can easily be yours in your own kitchen. The chocolate tart recipe from here is incredible. 4.0 out of 5 starsProbably one of the most beautiful cookbooks ever! This is a beautiful cookbook with a variety of recipes for teatime pastries. I didn’t know about the teatime custom in France until I read this book. There are all sorts of recipes – some of which look quite daunting to say the least, but I may give even those ones a try. I’d like to try out most of the recipes, which seem quite clear and are full of helpful photos. This book is also fun in that it’s a bit of a travel book – a sort of walking tour of some wonderful looking patisseries in Paris. The author lives in Paris and gives walking tours of patisseries throughout Paris. Can you imagine? That would be such incredible fun! As I read this, I had fond memories of our trip to Paris several years ago, and gosh, it makes me want to visit there again! This book is a gorgeous visual feast and would be a lovely gift for those who enjoy baking. I found Jill on Instagram and fell in love with her photos of food, travel, and everyday life in France. Buying her books was the next logical step. Filled with scrumptious recipes and beautiful photos, this book is a delight to browse through. I am not much of a baker, so I cannot review the recipes yet, but the imagery holds me captive every time I pick up the book. P.S. My 10 yo daughter can't wait to try her hand at the pistachio and cherry kirsch choux puffs! I read this cookbook cover to cover. Seems well written. I will, try recipes from this book. I have no experience with French baking, so I can't say how much value my me opinion is at this time. Mostly I bake quick bread and yeast breads and of course cookies. I sell them at a local Flea Market and to friends. So I bake a lot and read a lot of recipes. I only try the ones that make sense to me -- I am excited to try these recipes, that's my best assessment for now. 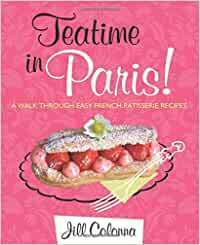 Teatime in Paris is a wonderful collection of beautiful pictures of French pastries and a wealth of information from an explanation of ingredients to a "sweets" walk to a chapter on baking essentials. The recipes are presented in a clear step-by-step form and include all the pastries I associate with the French. The Madeleines are delicious! I'm looking forward to using the many recipes for macaroons. Great Pictures, Great Recipes, Great Memories…Makes me want to be back in Paris.